I came out of college feeling like I didn’t need any more friends. I’m not sure if that sounds conceited or tragic, but I felt that I had a few really good friends, and while I was happy to meet and hang out with other people, I didn’t need to keep searching for people to share everything with. I spent my first year and a half in New York operating under this plan. I met some great people but, for whatever reason, didn’t allow myself to get close to anyone new. Life tends to work in funny ways though, and last summer, I met Proma, Radhika, and Rads. I have been dancing with Ajna Dance Company since I first moved to New York. Last summer, two new girls joined – Proma and Radhika. Proma, I had actually met when I was 16, through some childhood friends. I had always felt we would get along (largely based on shared obsessions with Harry Potter and dance). Radhika was bubbly and came over to learn the Ajna choreography. We met Rads through Proma and together, the four of us quickly became friends. 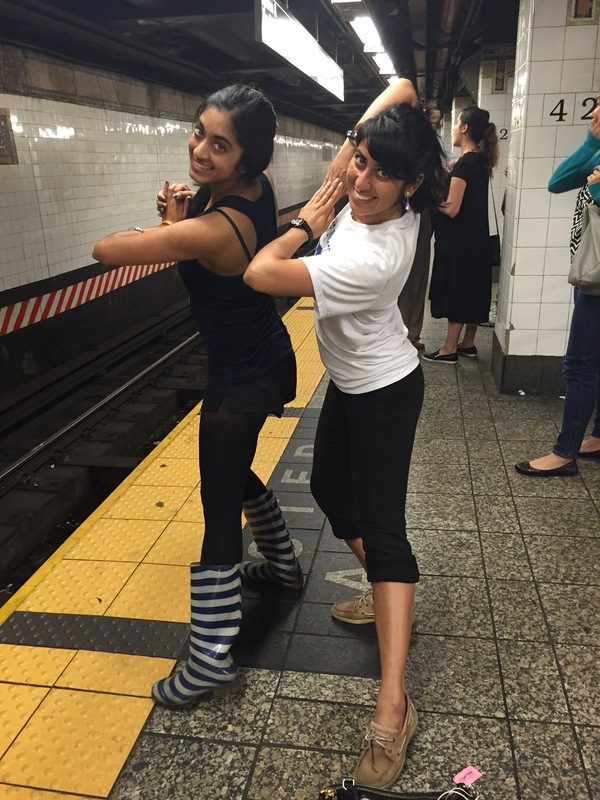 Proma & Radhika posing for me as we make our weekly connection through Grand Central Station on our way home from rehearsal. What I love about our little ‘crew’ (we call ourselves “Uptown Funk” – sorry not sorry) is how easy it is. We’re different ages, but all mid-twenties, we have very different personalities, yet we tend to be on similar wavelengths, we have a variety of interests, but we all push each other creatively. (Writing about Jasmine and my psychic experience was largely thanks to their encouragement to keep writing.) Best of all, I know I can rely on them. Rads taking a mirror selfie of us the night before I left for Chicago. I’m interested to know what other people’s experiences have been. Have you made an unexpected connection or a new friendship recently? Do you expect to or do you think you’ve already made your “lifelong friendships”? Let me know in the comments below! I have great friends and I have space form more. Loved your story. I try to always be on the look-out for friends. They always seem to reveal stuff about myself that I didn’t know existed! Sounds like you have a good bunch. That’s very true! Good friends open your eyes to new things about the world and new things about yourself.